Warrington Disability Partnership has launched their latest new service, this time at Warrington Hospital, In Partnership with Warrington and Halton Hospitals NHS Foundation Trust, with support from ten local businesses, the service will provide information, advice and guidance on disability matters, based within a retail store offering mobility and independent living products. Over 30 guests were present at the official opening event including the Mayor of Warrington, representatives from health, social care, local businesses and members of WDPs Board of Trustees and staff. There are nearly 14 million reasons why this service is needed, as there are 14 million disabled people living in the UK and 60,000 live in Warrington and Halton. Thats not to mention 40,000 carers was a quote from Warrington Disability partnerships CEO, Dave Thompson MBE DL at the official opening of the new Mobility and Independent Living service at Warrington Hospital on Tuesday afternoon. Steve Mcguirk, Chair at the Trust said This new service will provide our patients and staff with direct access to mobility and independent living products, as well as peer support, information, advice and guidance to disabled people, from disabled people, at the point where people need it most. 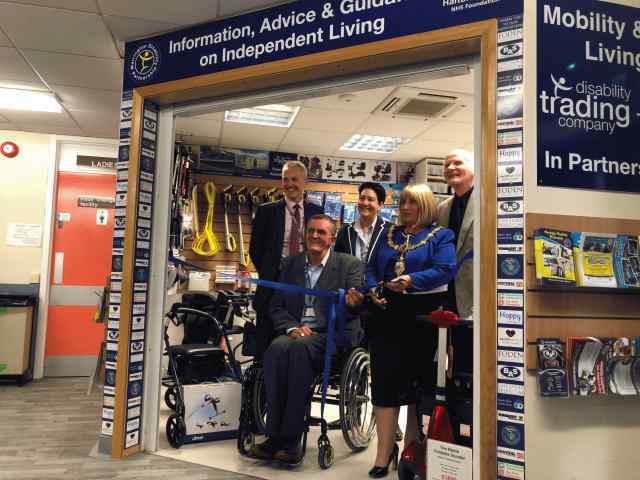 Dave Thompson added, This will help to rebuild confidence, improve self-esteem and enable disabled people to have more independence and choices on how they live. Before cutting the ribbon to open the new service, the Mayor of Warrington, Councillor Karen Mundry paid tribute to the local businesses who have financially supported the new venture. Including; Cheshire Telecom, BAS (NW), Dunkys Day Nursery, Foden Estates, Mech Tech Automotive, Central Self Drive, The Print Company, Toni & Guy, Hoppy Trust and Health Service Money Claims.